400 million connected light bulbs installed by 2020 | What's The Big Data? 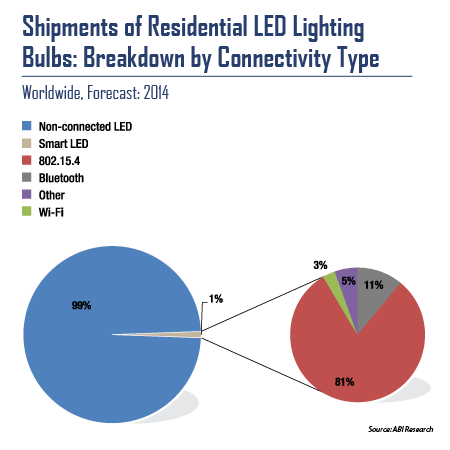 The market for connected LED or “smart” light bulbs is in its embryonic stage of development, with shipments totaling fewer than 2.5 million units in 2013. However, falling LED prices and the endorsement of ZigBee Light Link as the preferred connectivity solution by a number of leading lighting manufacturers means that annual smart bulb shipments are set to increase to 223 million by 2020, achieving a total installed base of over 400 million. “Because of the additional dimensions smart lighting brings to the consumer lifestyle, including lighting automation, and because of its carbon footprint efficiency, this industry will rapidly become one of the key technologies that could bring IoE closer to consumers,” commented Malik Saadi, Practice Director at ABI Research. 802.15.4-enabled light bulbs will become the dominant connectivity solution, taking a three-quarter share of the market throughout this period. Among these, ZigBee will be the most prolific. As time progresses ZigBee will face increasing competition from emerging alternatives such as the 6LoWPAN based protocols such as Thread, Bluetooth Smart, and Wi-Fi—particularly mesh and low-power variants. The prices of LED bulbs continue to fall rapidly and because their replacement cycles are significantly longer than traditional light bulbs, the market is predicted to quickly saturate. “Overall LED light bulb sales are currently driven by new additions but as the market saturates, industry players will increasingly use connectivity to bring added value features and services to residential lighting systems and attempt to boost consumers’ interest in upgrading to a smarter lighting environment,” Saadi said. These findings are part of ABI Research’s IoE Semiconductors and Smart Home Market Research. This entry was posted in Internet of Things, smart home. Bookmark the permalink.